How To Measure Full Lace Wig? 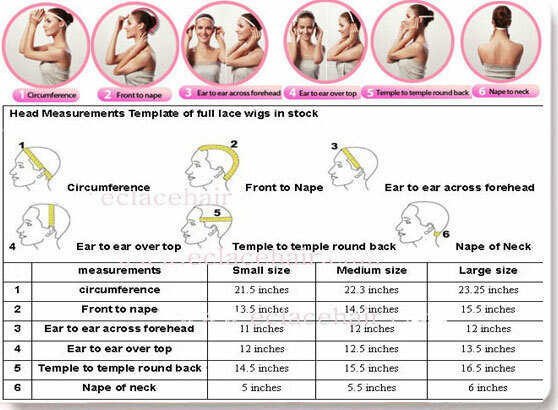 A lace wig with correct size can fit you well and let you feel very comfortalbe and excellent when wearing it,how can you do if it is not suitable envn you adjusted by adjustabl straps?the only thing you should do is return it to seller.so we should measure lace wig carefully.the measurements include circumference, width from ear to ear(cross forhead or crosss top),length from the front to the back of the head,nape of neck.These measurements are also suitable in designing custom wigs. Their are three standard full lace wig size:small size,medium size and large size.Learning how to correctly measure the size of the wig and your head can help you find the suitable wig that fits you exactly,and you needn't try on every one in the store or exchange other wig when you find the wig size can't fit your head. Now you can know if a wig can fit your head or not without wearing the full lace wig on head. View previous：What We Should Know When Curl Human Hair Wigs? View next：How To Style Long Front Lace Wigs?